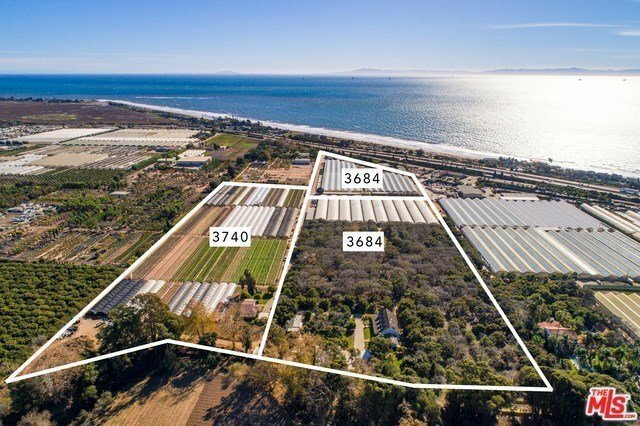 Incredible rare opportunity to purchase 30 + acres of prime agricultural land, consisting of 3 parcels - APN 005-430-038, 005-430-004, and 005-430-057, all being sold together. Currently a flower growing operation, with 166,500 SF of fully hydroponic glass greenhouses, and approximately 442,000 SF of hoop houses. In addition there are 3 residences on the properties, and 8 acres of avocados. Electric meters on all the parcels, 2 inch ag water meters on 2 of the parcels, and gas meter and private water well servicing all 3 parcels. Front parcel includes Padaro Floral warehouse w/ refrigeration, offices, and 2 bathrooms. Income from the 4 bedroom, 3 bath home located in the back rear parcel is currently $4000/month, and is in excellent condition. 2 parcels are in the Williamson Act.